View of the high street of Cuckfield, a quiet hilly village situated along the road between Brighton and London. 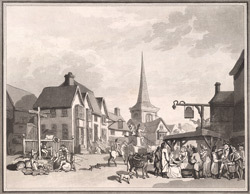 The artist Thomas Rowlandson gives one of his familiar, knotty and slightly caricatured views of the inhabitants, who are seen buying and selling goods from stalls. The village itself is represented by taverns, with the parish church spire visible in the background.